The TV in the kitchen has long had a Mac Mini attached to one of its inputs. We used it to watch Youtube videos, listen to music from iTunes and Google Music, to browse the web, to show photographs from our trips, and so on. Sadly, the little Mini passed away earlier this year, refusing to power up. When we priced out replacement machines we discovered that the new Minis were a lot more expensive, even if a the same time more capable. Which brought the total expense to $ 297.73, substantially cheaper than the more highly configured i5-based servers that we described in a previous post. We ordered the parts from Amazon and they arrived a few days later. The next step was to get the BIOS patches needed for the machine and an install image. The new BIOS image came from the Intel site. Note that the BIOS for the DYE line is different from that in the i5-based WYK line that we used for the servers. The BIOS patch that we downloaded is named gk0054.bio and we found it on an Intel page (easier to find with a search engine than with the Intel site navigation tools, but easy either way). The Ubuntu desktop image is on the Ubuntu site … they ask you for a donation (give one if you can afford it, please). Where /dev/disk2 and /dev/rdisk2 are identified from examination of the output of the diskutil list call. That done, we recorded the MAC address from the NUC packaging and updated our DHCP and DNS configurations so that the machine would get its host name and IP address from our infrastructure. 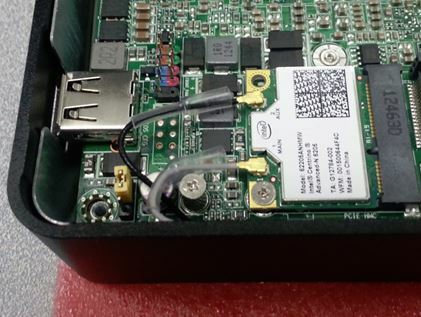 We added the WiFi and Bluetooth network card to the machine. We did not use the WiFi capability, since we were installing the machine in a location with good hard-wired Ethernet connectivity, but we did plan to use a Bluetooth keyboard and mouse on the machine. The desktop install image for Ubuntu 14.04 is big, about 1/3 larger than the server image. The first device we used for the install was the same 1G drive that I had used for my initial server installs, before I got the network install working. What we didn’t realize, and dd did not tell us, is that the image was too big for the 1G drive. When we tried to do the install the first time we got a cryptic error message from the BIOS. It took us a while, stumbling around in the dark, to realize that the install image was too big for the drive we were using. After we rebuilt the install image on a 32G drive we had in a drawer, the install proceeded without error. 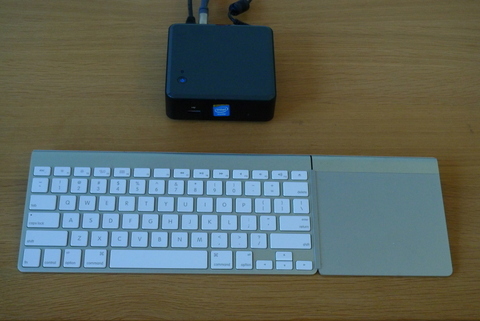 After the installation completed we had trouble getting the Bluetooth keyboard and mouse to work well. The machine ultimately paired with the keyboard, but we could not get input to it. Shortly after we were logged on to the machine. We installed Chrome and connected up to a Google Music library and were playing music as background to a photo slide show within a few minutes. The only remaining problem is that the Apple Wireless Trackpad that we’re using seems to regularly stop talking to the machine. The pointer freezes and we’re left using the tab key to navigate the fields of the active window. The content of “cat /proc/cpuinfo” is actually four copies this, with small variations in core id (ranging between 0 and 1), the processor (ranging between 0 and 3), and the apcid (ranging from 0 to 3). In order to add this information to my sysinfo.py I wrote a new module, cpuinfo.py, modeled on the df.py module that I used to add filesystem information. # the separator between attribute and value is "/t+: "
""" An object with key data from the content of the /proc/cpuinfo file """
""" Display the object as a JSON string (prettyprinted) """
""" return the array of cpus """
""" get the content of /proc/cpuinfo and populate the arrays """
# o each block has the processor id (0, 1, ...) as its first row. The state machine implicit in the main loop of populate() is plausibly efficient, though there remains something about it that annoys me. I need to think about edge cases and failure modes to see whether I can make it better. I am tempted to augment the module with a configuration capability that would let me set sysinfo up to restrict the set of data from /dev/cpuinfo that I actually include in the sysinfo structure. Do I need “fpu” and “fpu_exception” or “clflush_size” for the things that I will be using the sysinfo stuff for? I’m skeptical. If I make it a configurable filter I can always incorporate data elements after I decide they’re interesting. It would be much more sensible to reduce the size and complexity of the processors section by consolidating the common parts and displaying the variant sections in some sensible subsidiary fashion. These items are discussed in this Intel web page.